Erich Leie was born on 10 September 1916 at Kiel. From August 1939, Leutnant Leie led the Reservestaffel of JG 71, a forerunner of 5./JG 51. On 21 March 1940, Leie transferred to III./JG 2. He claimed his first victory on 14 May, during the French campaign, when he shot down a RAF Blenheim twin-engine bomber. By October 1940, Leie was serving in the Geschwaderstab of JG 2, whose Kommodore was Helmut Wick (56 victories, RK-EL, killed in action 28 November 1940) and the Adjutant was Hauptmann Rudolf Pflanz (52 victories, RK, killed in action 31 July 1942). By the end of 1940, he had 11 victories to his credit. Leie recorded his 12th victory on 22 June 1941, when he shot down a RAF Spitfire fighter between St Omer and Arques. From July 1941, Leie was a member of Walter Oesau’s (127 victories, RK-S, killed in action 11 May 1944) Geschwaderstab in JG 2. He was awarded the Ritterkreuz on 1 August 1941 following 21 victories on the Channel front. By the end of 1941, his victory total had reached 32, including six RAF Spitfires shot down on 23 July to record his 16th through 21st victories and his 30th victory on 8 November, another Spitfire shot down over the Somme Estuary. On 4 May 1942, Oberleutnant Leie was appointed Gruppenkommandeur of I./JG 2. He participated in the air-battle over Dieppe on 19 August, claiming a RAF Spitfire fighter as his 42nd victory. However, he was shot down and wounded during this engagement. He successfully baled out of his Fw 190 A-3 (W.Nr. 130 326). Kommandeur I./JG 2 Oblt. Erich Leie visited 1./JG 2 after his injury in battle over Dieppe on 19.8.1942. 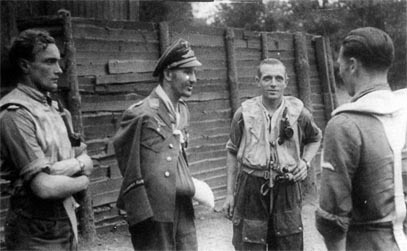 From left: Lt. Josef Wurmheller (102 v. RK-S, KIA on 22.6.1944), Oblt. Leie, Hptm. Hans-Jürgen Heppe (at least 10 victories) and Uffz. Heinz Dowahn (KIA 21.11.1942). Following the death of Oberleutnant Rudolf Busch (40 victories, DKiG) on 17 January 1943, Leie was named Gruppenkommandeur of I./JG 51, based on the Eastern front, and was to remain at the helm for almost two years. Three Gruppen of JG 51 (I., III. And IV./JG 51) and I./JG 54 provided the main Fw 190 A presence on the Eastern Front during the early months of 1943. I./JG 51 was being rotated between Lake Ivan, east of Moscow, Vyazma and Orel shoring up the central sector of the Eastern Front. Leie successfully led the Gruppe during the offensive operations leading up to Operation Zitadelle, the Battle of Kursk, during July 1943. With the failure of the Kursk offensive the long slow retreat towards the Reich’s frontiers began. On 6 November 1943, Major Leie shot down four enemy aircraft to record his 97th through 100th victories. He was granted a lengthy spell of leave at the end of March. He returned to front line duty only to be shot down in aerial combat with Russian fighters on 6 July. He baled out of his stricken aircraft over Russian lines but was fortunate in that his parachute was blown back over German lines. By October 1944, Leie’s victory total stood at 114. Promoted Geschwaderkommodore of JG 77 on 29 December 1944, Leie was killed over Czechoslovakia on 7 March 1945, when he collided with a crashing Russian Yak 9 fighter and failed to survive a low level bail-out from his Bf 109 G-14/AS (W.Nr. 786 329) “Black <1+ ”. He was posthumously promoted to the rank of Oberstleutnant and recommended for the award of the Eichenlaub. 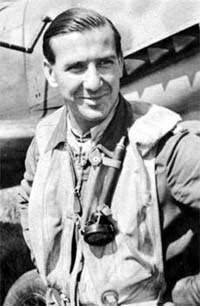 Erich Leie was credited with 118 victories in over 500 missions. He recorded 76 victories over the Eastern front, including 32 Sturmovik ground attack aircraft. Of his 42 confirmed victories recorded over the Western front, 30 were Spitfire fighters and one was a four-engine bomber. 14:05 MiG-3 7./JG 51? 7376 / not confirmed ? 16:32 Il-2 Stab I./JG 51 35 423 / not confirmed ? 16:41 Il-2 Stab I./JG 51 35 491 / not confirmed ?